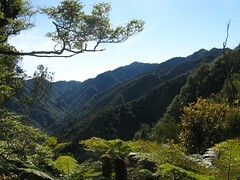 Deception Spur has an ominous name, but it’s really just another spur in the Tararuas. I’ve been up the spur before, and from what I remembered of it, I didn’t have any hesitation in agreeing to walk up it again. This is what we did last weekend. 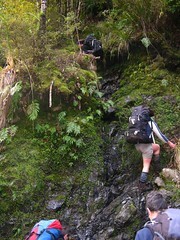 Location: Tararua Forest Park, Ohau and Mangahao region. People: Amanda, Dirk, Illona, Richard, Duncan and me. Huts visited: Mangahao Flats Hut (1 night). Route: From Poads Road to the Ohau River (camping a couple of minutes before it), up the Ohau River to Deception Spur (where the North and South Ohau split), up Deception Spur, down into the Mangahao River on the other side, and to Mangahao Flats Hut for Saturday night. Out at the Mangahao Dams on Sunday. We began having made some vehicle relocation arrangements that dropped us at the end of Poads Road, east of Levin, at around 9pm, and from there we walked about an hour in the darkness to what’s a very nice camp-site about 2 minutes before the track meets the actual Ohau river, almost exactly at the point that a dry weather track heads up the Gable End Ridge. There’s a walk through some often muddy farm-land at first, past the moo-cows and electric fences, but after that it’s all under trees. The campsite has an open clearing with a fire pit, but the best camping spots are under the nearby trees, and there are lots of them. Last time I visited this camp-site was with Craig, John and Paul, and at that time we had plans to do something very similar to this weekend. For various reasons, we changed our plans and I missed out on seeing the Mangahao River at the time, but on this occasion it all worked out. Having woken at 6.45, we packed up and were away so that we walked into the Ohau River — the water supply of Levin — shortly before 8am. 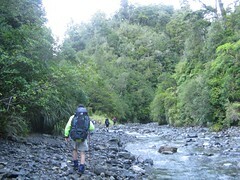 River levels were conveniently low, albeit with very cold morning water, and it was a straight-forward walk up the Ohau to the base of Deception Spur, 40 minutes later, which is where the South Ohau and the North Ohau rivers join. Each of these branches has its own hut further up, with each hut being named after the branch on which it resides. On this occasion we didn’t want to follow either, but instead head up the spur between the two. The lower end of Deception Spur. Deception Spur is actually really steep in places for the first 15 or 20 minutes, more-so than I remembered it from a couple of years before. There are several places where it’s necessary to clamber up walls several metres in height that at least feel near vertical, and which are steep enough to allow for quite a slide if you slipped. It still seems very safe, however, simply because there’s so much dense kruft growing on the spur that it’s difficult enough to move, let alone fall off. Although it can make things awkward to bash through, it also means there isn’t really a shortage of hand-holds and foot-holds. The biggest danger is probably getting a pack caught on something and having it spring you backwards with an unexpected great force, so there’s still some need for care in that respect. A brief window through the trees. Things thin out a little after about 20 minutes, and although there are patches of thick scrub to awkwardly push through, it’s easier, and becomes more typical for the 600 metre climb towards spot-height 865. There was a small window in the trees after a couple of hours, from which we could see some of the higher ridges towards the north. I took a photo for the record, but all of Deception Spur remains under the bush-line to the top, so this particular view is unusual. Perhaps half an hour after that, we reached the ridge-line at the top of the spur, and found a place just over the top, where warm sun was creeping through the tree branches to have some lunch. From here we’d be navigating down the far side on compass bearings, and when it became apparent that we used different methods for compass reading and therefore ended up with different bearings, we spent much of the time arguing about which is the more True North — grid north or magnetic north. I guess the irony is that neither of them is parallel with the Earth’s rotational axis. Our plan, from spot-height 865, was to head south-south-west to the top of a slip (marked on LINZ’s topo map), then head roughly east down a vague spur to the Mangahao River, which we began at around 12pm. It appears very steep at first, but there’s not much alternative so it’s really just a matter of being cautious to hold onto things as appropriate and not to slide too far. The first thing to take note of when doing this is to avoid wandering west along another spur towards spot-height 660, and eventually down towards South Ohau Hut. That’s the wrong way (unless you’re trying to do it for some reason). The second thing to be cautious of is walking off the top of the slip. It’s a wide open view through a small gap in the trees above the slip. The ridge in that direction trends towards it, and it’s probably not a bad idea to stop before falling off. It was also the point at which we’d turn to the east. The route east from here wasn’t clearly marked with any obvious trail, but it wasn’t so thick and overgrown to make it difficult to push through the trees. There was some debate about whether we should try to stay on the ridge, or sidle it in the gully to its north. Things became clearer when half way down, we started seeing blue triangle markers on the trees which were consistent with what Illona identified for us as stoat tunnels, which are used recurringly to monitor the densities of stoats that enjoy peanut butter so that DOC knows how much to budget for when it feeds them, or something like that. At regular intervals, someone will walk up the route and bait the tunnels, then come back the next evening to count the tracks of stoats left in the tunnels and get a better idea of how many there are. We followed the marker trail all the way to the Mangahao River, which ultimately took us down the small side creek to the north of the spur, and the numbering on the markers gave us a handy count-down to indicate our distance from the river at the bottom. 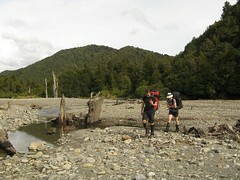 We reached it at around 1.10pm, just over an hour after leaving point 865.
on the edge of the Mangahao River. With a hop through the river and after a short sit-down, we were now able to walk along 2 km of the track beside it towards Mangahao Hut, our destination for the evening. 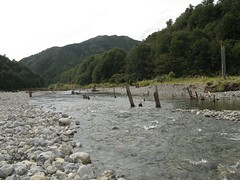 Although it’s generally quite a nice track as Tararua tramping tracks go, there are one or two places where the track alongside the Mangahao River gets a little hairy. Storm damage from a couple of years ago still hasn’t been completely worked around, and at least one of the side creeks had us placing rather a lot of trust in some loose-feeling branches in order to climb up to where the track continued. Overall this is just part of it, however, and we reached the sunny Mangahao Flats Hut at about 2.30pm. We expected to meet another group here this evening but they hadn’t arrived yet, so we stretched out, rinsed off, and went on a firewood collecting mission. 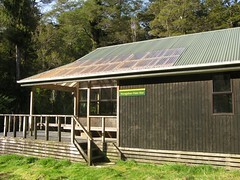 Mangahao Flats Hut is a really nice hut. It’s a similar design as Waitewaewae, with 16 platform bunks and a heap of room on the floor or outside if it’s needed. When our other group showed up and we could exchange van keys, we still weren’t crowded. There’s a nice vista out over the river, which has wide banks, and it’s possible to go for a nice walk over the rocks. Still being near the end of winter months, the sun was setting by 6pm and with Dirk having built a fire, we settled into Amanda’s nicely organised dinner of smoked salmon pasta. 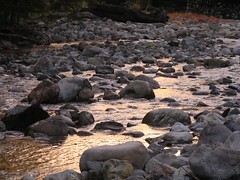 Mangahao River during early morning. After 12 hours of sleep, people slowly began to rise in sequence some time before 7am, albeit with no major rush to leave. I wandered down towards the river as I muched my brekkie to take in some of the quiet morning atmosphere as the sun slowly emerged. 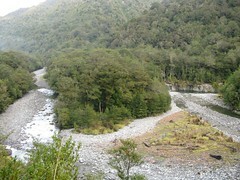 The Mangahao River must be one of the nicest rivers in the Tararuas. It’s wide and scenic, and it’s also gorgey in places which must mean lots of good swimming holes. I’d like to walk along it in the future, keeping in mind that there would probably need to be at least some pack-floating to do it properly. It was about 8am when we finally left, heading along the main track towards the Mangahao Dams, where our vehicle was parked. About the third major side-creek on the true right, about 25 minutes north-east of the hut, is probably the most awkward along the entire walk. Storm damage still remains from a couple of years before. To stay on the track it’s necessary to clamber up a rather steep wall, although we had an option of walking along the river if we’d wanted to. 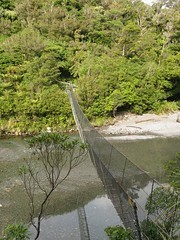 The track sidles high above a slip from where there’s a scenic view of the Mangahao negotiating a hair-pin bend, before it descends back to the level of the river. At this point an informal sign nailed to a tree notifies those coming from the direction of the dams of the option between the wet feet and dry feet routes. The track itself continues along the river bank above some areas which appear quite gorgey, and we stopped quite often so Illona (the resident ecologist) could point out all the Bellbirds, Squeaky Tricycles (aka Tomtits) and Machine Guns (aka Whiteheads). An hour from the hut (our time), a bridge crosses Barra Stream. 30 minutes later, just before another bridge crosses Harris Creek, there’s a very nice camp-site at the flats on the river-side of the track. It comes complete with a picnic table, and we also noticed a couple of folded tarps pushed under nearby branches which probably means the site is well used. 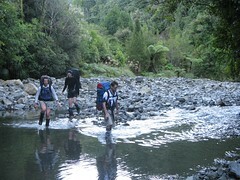 We ambled our way to the major bridge over the Mangahao River, reaching it at 11am. The bridge is currently one of the classic 40 year old swing bridge designs, but it appears DOC is gearing up to replace it with one of their more modern designs, given that both ends show preparations. 45 minutes from the bridge, we walked off the marked track and into the wide and mostly dry bed of the Mangahao River, just before it reaches the No 1 Reservoir behind the top dam. With the weather that we had, there was no need for the marked track any longer, and we left it inside the trees to follow the main route of the river out in the wide open. Probably the reason the river bed is so wide is because it borders the reservoir, and at times this entire area would be artificially filled behind the dam. The region itself is a cemetary of dead trees, remnants before the time of building the dams in the 1920s, and drowned nearly a century ago during times when reservoir was filled to a higher level. Today they’re simply skeletons, surrounded by a sea of river rocks. It’s strange to think of the Tararuas as a place that would be dammed like this, yet in the middle of the 20th century there were plans for even more massive damming which would have changed the landscape of the range to an even more massive and noticeable extent. We stopped for lunch in this curious landscape, before resuming the 15 minute walk to the dam, to the parked van, and to an exit from the Tararuas early on Sunday afternoon. 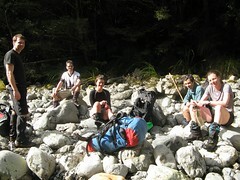 This entry was posted in tramping and tagged bagged:mangahao flats hut, navigation, rivers, tararuas, tramping, wellington tramping and mountaineering club. Bookmark the permalink. I used to camp a bit upstream from Harris Creek quite a bit when I first moved to New Zealand, as the hut even then was a real mess and I think now gone altogether. Is South Ohau hut still there? I walked up river on my own years ago to it but I heard there was a bad slip there a number of years ago which caused it to be closed, possibly removed. Hope I am wrong in that. It was a cool little hut as I remember. Great write up, you have stirred up my interest to revisit these places I have not been for years. Happy tramping. Thanks for the comments. 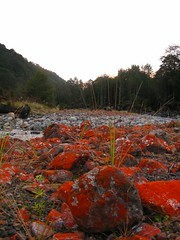 Lately I’ve decided the Mangahao is my favourite river in the Tararuas, or perhaps that was just first impressions. I’d love to see it in flood one day. Yes Harris Creek Hut is gone, and now there’s only a bridge next to where it used to be. It’s still marked on my map, but I forgot to take a close look at the area when we walked past it. There’s good camping around the flats in that area, however. As of 20 January 2013, the swing bridge over the river still hasn’t been replaced, but the towers for the new bridge on either side of the river are partially completed. Thanks, Ross. They’re certainly taking their time.